What Is Going On In Donetsk? Does anybody know what is going on here? May be it is a flashmob or something like this? 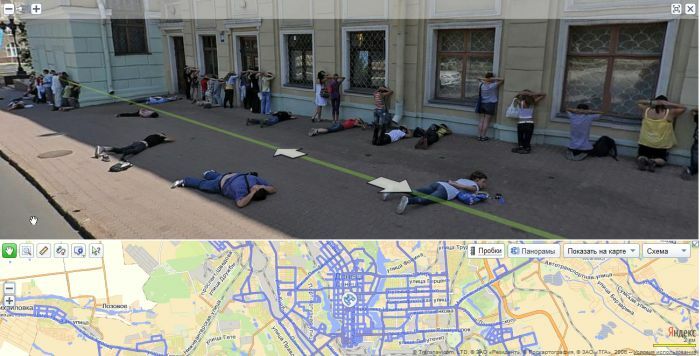 These pictures were taken from Yandex Maps. Do you feel lucky punk ? Google stick up. Your money or your privacy! What ever it is, I hope the Hell it doesn’t lead to Femen protesters! Probably…no policemen there, nobody gathered around. You mean flashmob? Yes looks like it. Instead of working or reading these people want fame. Fame is bourgeois. A. Bunka here. Ha! The cult of personality is central to Communist Ideology. NAme one communist government that did not have it. Archy, Stalin started the cult of personality; therefore, it was not inherent in Marxist ideology. So, look back to the Soviet Union from 1922-30. There was no banners, statues, etc. of Lenin, Trotsky, Bukharin, Zinoviev, Kamenev, etc. All that garbage came with Stalin’s reign. Well, I’m slightly wrong. Donetsk was called Stalin and then Stalino in the 20s-30s and beyond. Guess that didn’t last with de-Stalinization. it is obviously the macarena, without music or any Latin influence of course. They knew the date the satelite would take the pic!Hapens on google earth often!Yes this is a big joke!